Two years ago, inhabitants of the ‘eternal city’ Rome had enough of the corruption scandals that had riddled previous left-wing and right-wing city administrations. Eager to change all that, they elected Ms Virginia Raggi of the anti-establishment Five Star Movement as the first female mayor of the city, hoping she would clean up and restore the Italian capital to its former glory. However, without all the ties that bind and the address book needed to get things done, Ms Raggi’s leadership of Rome has left it in a worse state than ever. Three events this week led to an outpouring of anger and 7,000 angry Romans demanding that she would resign. Firstly, a viral video showed a family of boars going through the trash in one of Rome’s suburbs. Secondly, a group of Russian football supporters was injured when the metro escalator broke down. And finally, a 16-year-old girl was raped and drugged in an abandoned building. Related coverage: <a href="http://thegoldwater.com/news/40471-Italy-3-Illegals-Arrested-Over-Shock-Murder-Teenage-Girl"> Italy - 3 Illegals Arrested Over Shock Murder Teenage Girl</a>. 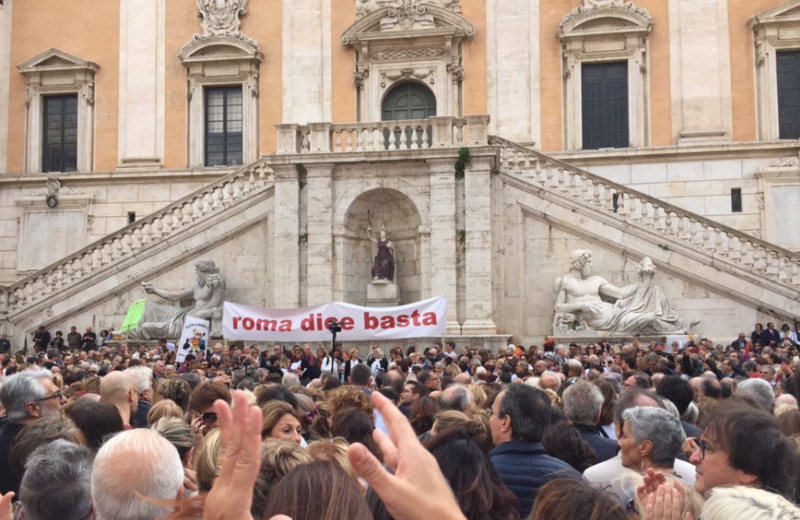 Yesterday, an angry group of protesters made up of residents’ associations and civil society groups, gathered under the hashtag #romadicebasta (“Rome says enough”), met on the steps of Rome’s mayoral offices and their protest drew between 5,000 and 8,000 people. Mayor Raggi claims that she needs more time to overcome the immense city’s myriad problems. However, inhabitants say that her leadership has only made things worse. A weeklong strike by rubbish collectors has left many garbage bins overflowing and potholes riddle the roads everywhere whilst Romans are known for their ‘wild’ driving manners. Meanwhile, the local public transport system is in permanent crisis. Some 20 buses have caught fire on the streets of the city so far this year, mostly due to poor maintenance.